I know just about everyone has heard of or spotted this popular makeup remover. It's the Bioderma Sensibio H20 Micelle Solution. It's actually the first product I've ever tried from Bioderma, just because I heard so many great reviews about it. It's a bit pricey at $22 a bottle, but for the amount of use I get from one bottle, I'd say it is of better value than $9 makeup remover wipes that come in packs of 20 or 30. I can't remember exactly how long my bottle has lasted, but it was well over 2 (or 3?) months with use on a daily basis. 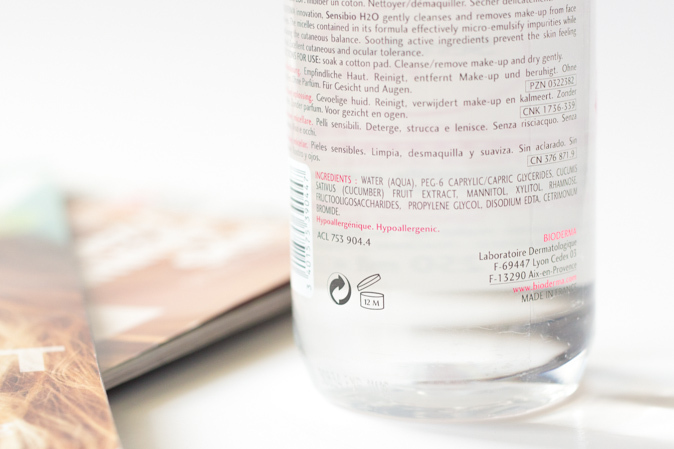 Bioderma's Sensibio is a micellar solution of which the main ingredient is water, and it has been formulated to be safe for sensitive skin, while removing even the most water-resistant makeup. It also claims to maintain the skin's pH balance. I love that this is fragrance and alcohol free, two ingredients I try to avoid putting directly on my face. I've used this as a makeup remover daily for the past few months and found that is doesn't feel like it dries out my skin, and it doesn't leave a sticky residue. For reference my skin has been very sensitive in the past but is somewhat normal-dry-oily now. I do come across products from time to time that break me out, but luckily this has not broke me out! This isn't effective enough to completely remove my waterproof mascara, and only lightly removes my eyeshadow and liner (I prefer to use an oil-based product for the eyes), but it is able to remove the rest of my foundation, bronzer, and blush. I usually saturate a cotton pad enough and then gently wipe the face. The more saturated the cotton pad is, the less pressure I need to put on my skin when wiping it. It doesn't sting my eyes, but I prefer to avoid the eye area regardless. It is also great when you make mistakes in the morning while applying makeup because it is not oil-based. I have used this and a q-tip, let it dry, and then fixed my mistake perfectly. The only downside is that I've found that occasionally my cheeks feel a little sensitive after use, and using a makeup remover is an additional step in your nightly skincare routine, especially if you are used to just using a cleanser to remove makeup. Oh and not a good idea to use it in between lip swatches :p was a bit too drying on the lips. Overall, it is great for normal-dry skin and slightly sensitive skin, for those who want to easily and effectively remove their makeup with a water based remover. 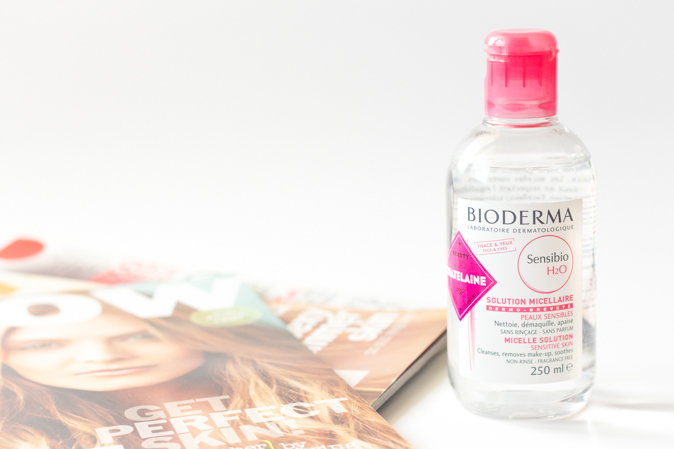 Bioderma Sensibio can be found in Canada at Shoppers Drug Mart, Murale.ca, and may be available on Amazon for international shoppers.